As a night owl I have always had difficulty waking up and getting going. As a mom of two little ones it has been difficult to get up and go with the same energy level that they are running at! My husband and I have worked out a system where he gets up with the kids and gets them breakfast and keeps them occupied until 7am when he needs to leave for work. At that time I’m able to get up and make some coffee and start waking up. A few times a week I will get my coffee, tea for my 3 year old, cheerios for the 14 month old and then snuggle on the couch and put on worship videos. My son will often ask for this and it warms my heart. When I asked him why he likes to do this he said “because Jesus comes and we do worship; it makes me feel happy; its good for me”. My favorite worship videos are from Bethel Music. Many of their videos are recordings from their worship services which includes not only the worship song but also spontaneous worship. My son has learned to recognize which songs we sing at church, which songs he hears me play on my worship playlist, and which worship videos are my favorites. It is important for me to model to him how to worship and how to incorporate it into my daily rhythms. Today when he asked for coffee, tea, and worship I asked him if we should try kids worship this time. He excitedly agreed! The first videos that came up on our search were Bethel Music Kids. I was so impressed with these videos. The videos were very energetic and engaging. The kids were excellent musicians and dancers. The first video we came across was Deep Cries Out. We recognized this song from our church services. The kids were playing in the water, dancing, signing, playing. This reminds me that kids play and have fun and that can be a form of worship. The third and final video we watched was This Is Amazing Grace, another we knew from our church worship. Here the kids are on their way to school but stop for an impromptu worship time with dancing and signing. Each person brings their solo dance and gets their turn to show off their moves. It is quite fun and again shows how being together with God’s children (the church) and worshiping together brings joy to us and to God. I so enjoy watching my boys worship! Of course my boys love music (how can they not?). But its even more exciting when they recognize it as worship music and I can see the joy on their faces. Watching my 14 month old clap his hands, smile broadly, bounce his little bottom to the beat, or raise his hands just warms my heart. I am so glad that they are learning at a young age to love worship. Worship changes my mood, sets the tone for my day, and encourages me to keep going on difficult days. Worshiping with my kids unifies us and puts us in a better mood. Most importantly we feel closer to God and know that He is pleased for the time we have spent with Him. 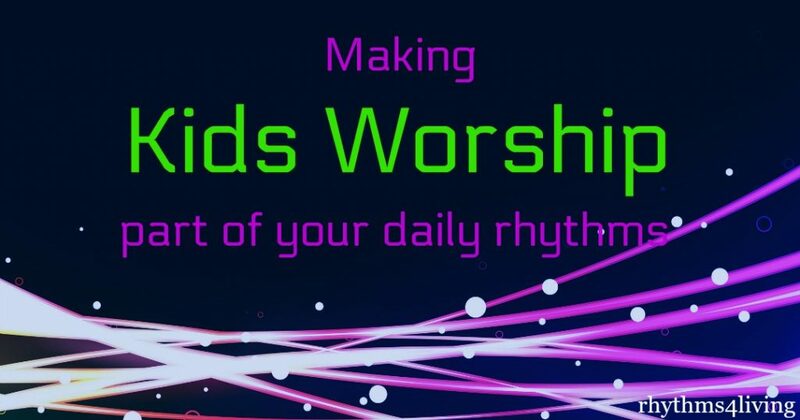 Check out our Kids Worship Playlist on YouTube. 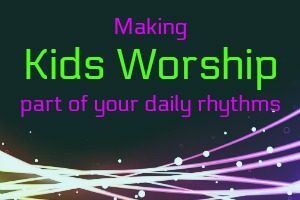 What are some of the ways you are incorporating worship in your daily rhythms? Let us know in the comments!